You specify the placement of a Popup control using the Placement property, indicating which side of the target control or region that you want the popup to appear on. If the popup extends off the edge of the screen in the direction corresponding to its placement (e.g. extends off bottom of screen when placement is Bottom), the placement jumps to the opposite side of the target control or rectangle. If the window is close to the bottom edge of the screen, the popup will jump to the top of the control. In addition to positioning a Popup control relative to another control or the mouse, you can position the Popup relative to an arbitrary rectangle. You can place a popup relative to an arbitrary rectangle by specifying a value for the PlacementRectangle property of the popup. You specify the left and top position of the rectangle, as well as the width and height. This describes the target rectangle that the Popup should be positioned relative to, in the coordinate space of the parent of the Popup. In the example below, we specify a rectangle within the Grid. The Popup will be positioned below this rectangle. To make the positioning easier to understand, we also draw the rectangle. <Button Content="Hover to See Popup"
<TextBlock Text="I'm a Popup" Background="AntiqueWhite"
When you position a Popup control, you can add horizontal or vertical offsets to move the Popup away from its target position. 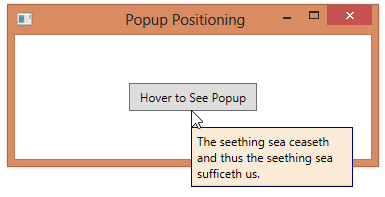 The popup’s HorizontalOffset property indicates how far to move the popup left or right. 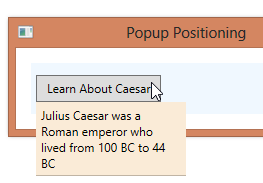 A positive value will move the popup to the right and a negative value will move it to the left. The popup’s VerticalOffset property indicates how far to move the popup up or down. A positive value will move the popu down and a negative value will move it up. In the example below, the Popup is placed relative to the bottom of a Button. It’s then moved 10 units to the right and 5 units down. <TextBlock Text="The seething sea ceaseth and thus the seething sea sufficeth us." 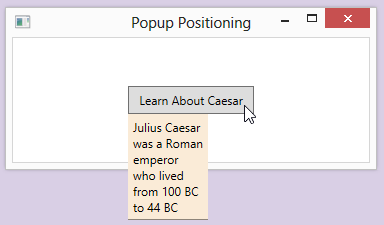 You can use the Placement property of a Popup to indicate how the popup should be positioned relative to another control. You specify the other control to position relative to, using the PlacementTarget property. You then use one of the values shown below for the Placement property. Note that there are other possible values for the Placement property. The subset listed below are the ones used to position the popup relative to another control. By default, a Popup control is positioned so that the upper left corner of the Popup lines up with the lower left corner of the element in which the Popup is contained. This places the Popup below the containing element. The element in which the Popup is contained is the parent element, as defined in XAML. This may not be the element that the user interacts with in order to make the Popup appear. Below, we have a Popup that appears whenever the user moves the mouse over a Button. But the Popup is defined within a StackPanel, so it is aligned with the bottom of the StackPanel when it appears.